Brad provides background information on the blues. He teaches you the 12 bar blues, 8 bar blues, and the first pattern of the minor blues scale. He examines this scale closely using scale theory. Chapter 1: (2:23) Introduction Brad plays a 12 bar blues in E with a nice rock and roll flavor. In this lesson, you will learn how blues slowly evolved into what we now know as rock and roll. Brad will give you all of the necessary information to play a blues. He will demonstrate rhythm techniques as well as some scales. These scales are the basic building blocks to playing your own blues solos. Chapter 2: (0:53) About This Lesson “Blues” is a catch-all term that can refer to many different things. When someone refers to “the blues,” he/she is referring to the genre of music. However, if someone says, “Let’s play a blues,” the person is referring to a specific 12 bar chord progression. This 12 bar form is quite simple. Thus, it lends itself extremely well to spontaneous improvisation. 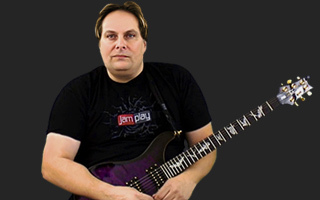 Brad will demonstrate the chords that comprise a 12 bar blues progression. In this lesson, an 8 bar variation on the standard 12 bar form is also discussed. “The best thing about blues is the feeling you get when you play it.” It’s safe to say that every professional blues guitarist that has ever lived would agree with this simple statement. Blues is a relatively basic form of music. The chord progressions are very simple and repetitive. However, this enables the musician to focus primarily on conveying emotion by playing directly from the heart instead of from the head. Chapter 3: (4:52) Learning the Blues Why Learn the Blues? Regardless of whether you enjoy listening to blues, every rock player should spend a significant amount of time studying blues guitar. 1. Learning a blues is the most effective way to learn how to improvise a solo. The scales utilized in blues improvisation are also the most commonly used scales in rock improvisation. 2. Learning how to improvise over a blues is a great way to develop a vocabulary of licks. 3. Techniques that originally developed in the blues genre have found their way into the rock genre over the years. Techniques such as bending strings and applying wide vibrato originated from the blues. 4. Basic music theory concepts regarding scale theory and chord progressions are explained easily in the context of the 12 bar blues form. Chords are referred to in two different ways. Chords are referred to by a specific letter name (C7 or GMAJ7 for example). Chords are also named based on the way they function within a given key or chord progression. Within any key, each chord has a specific function or job to do. Roman numerals are used to represent a chord and its function in a key. Let’s examine the key of C Major to see how this works. The key of C is the easiest to start with since it contains no sharps or flats in the key signature. The C Major scale is spelled as follows: C D E F G A B C. Each note in the scale is now given a Roman numeral based on its position in the scale. A basic 12 bar blues progression utilizes only three chords. A blues consists of the I, IV, and V chords. In the key of C, these chords are C, F, and G.
A 12 bar blues consists of the I, IV, and V chords. As a result, we will use A, D, and E chords for a blues in A. Chapter 4: (10:30) 12 Bar Blues Frequently, guitarists choose to play each chord in a blues progression as dominant seventh chords (A7, D7, and E7). These chords give the progression a much bluesier feel overall. Standard major triads are acceptable, but they tend to make the progression sound rather stale. Take this time to review these basic open chord shapes. Note: Click the “Supplemental Content” tab for fretboard diagrams of these chord shapes. You can also access these chords in Jamplay’s Chord Library. So how do these chords fit into the 12 bar progression? Here’s a quick measure-by-measure breakdown of the chord changes. Bars 11 and 12 form what is called a “turnaround” progression. A turnaround is a short progression consisting of the I and V chord. The turnaround typically occurs at the end of most blues progressions. It serves as a quick transition back to the beginning of the form. Note: Turnarounds in the Jazz genre are typically played as ii V I instead of V to I. Consult Matt’s Phase II Jazz lessons for more information. When you begin to practice the 12 bar progression, start by strumming in simple quarter notes. Use a downstroke for each strum. Once you can play the progression accurately from memory, begin to implement some of the strumming techniques Brad demonstrates at 2:13. Brad plays the progression in all eighth notes using downstrokes. He also adds some light palm-muting to the right hand. Notice the lazy swing feel of the rhythm. This is a crucial component of blues music. A pair of eighth notes is played as a quarter note triplet followed by an eighth note triplet. This long-short rhythm contributes to the swinging blues rhythm. Brad also demonstrates how to play the same progression using barre chords. If you have not learned many barre chords yet, stick to the first progression for now. Slowly incorporate barre chords into your daily practice. Focus on one chord at a time. Be patient! It typically takes a student a couple weeks to master his/her first barre chord. Playing barre chords enables you to add some percussive muting effects with the left hand. Note: Click the “Supplemental Content” tab for fretboard diagrams of these chords. Another popular way to play the 12 bar blues form is called the Blues Shuffle. A shuffle can describe any piece of music that features the long-short, swinging rhythm of eighth notes. Note: A shuffle also refers to a quick rhythm in 12/8 in which the first note in a group of three receives the heaviest stress. The rhythm is subdivided into a quick triplet feel. Black Sabbath was the original master of the heavy shuffle. “United States of America” by Smashing Pumpkins is a great modern example of the shuffle. To perform a blues shuffle, start with an A5 power chord. Fret the sixth string at the 5th fret with the first finger. Then, fret the fifth string at the 7th fret with the third finger. This is the basic A5 chord shape. Now, stretch your pinky in order to the 9th fret of the A string. This note is a major sixth interval from the root A. These basic chord shapes are used to play a blues shuffle. Watch carefully as Brad demonstrates how to play the shuffle at 6:30. Also, check out the “Supplemental Content” section for some additional help. Chapter 5: (1:42) The Quick Change In bar 2 of the 12 bar blues, the IV chord is frequently substituted for the I chord. As a result, D7 is typically played in bar 2. Jazz musicians almost always play the IV chord in bar 2. Adding this extra chord change to the progression saves the harmony from sounding too stagnant in the first four measures. Note: The 8 bar blues can also be played as a shuffle. Once again use the power chord to root/sixth shapes to play this form. Note: The 8 bar blues occurs far less popular than the 12 bar form. As a result, more practice time should be devoted to mastering the 12 bar form of the blues. Chapter 7: (7:29) The Blues Scale Brad opens this scene with some hot licks from the A blues scale. Brad presents this scale in the key of A. It is spelled as follows: A, C, D, Eb, E, G, A. There are five different finger patterns for this scale that span the entire fretboard. Guitarists and instructors frequently refer to these five patterns as the pentatonic “boxes.” In this scene, Brad demonstrates the most commonly used blues scale box. The first box is played entirely in fifth position. This means that the first finger does not stray from the 5th fret. Note: Click the “Supplemental Content” tab for a fretboard diagram of this scale pattern. When practicing through the scale, adhere strictly to the fingerings Brad has indicated. When soloing however, the notes that are played with the pinky finger are frequently played with the third finger to accommodate techniques such as string bending. The first step to take in becoming a soloist is memorizing your scales inside and out. Brad applies a technique referred to as “vibrato” as he plays through the blues scale. Vibrato creates a pulsating effect by rapidly moving a pitch back and forth. There are a few different ways of performing vibrato on guitar. The vibrato typically originates primarily from either the wrist or the finger muscles. These muscles combine to create a steady shaking movement. Regardless of the technique you utilize, use your ears to guide your vibrato. Vibrato adds extra dramatic effect to the end of phrases. However, use this technique sparingly. You can have too much of a good thing. Chapter 8: (6:57) The Major Scale The Major scale is one of the most fundamental units of music. Brad begins by breaking down some basic theory pertaining to this scale. Let’s start at square 1. The musical alphabet consists of the following notes: A, B, C, D, E, F, and G. The distance between one consecutive note to the next can either be described as a half step or a whole step. It may help to examine a piano keyboard to visualize this concept. The keyboard consists of black keys and white keys. A half step occurs between one key to the next regardless of color. Similarly, a half step on the guitar occurs from one fret to the next. A whole step occurs between two frets on the guitar. For example, a whole step occurs between F on the 1st string and G on the 1st string. These notes are two frets apart. Now, let’s return to the musical alphabet to apply these concepts. Make a careful note of where half steps and whole steps occur. Many of you are probably wondering how all this theory is going to help your guitar playing. The answer is simple. All major scales follow the same pattern of half and whole steps. If you know this pattern, you can start on any given note and play a major scale. Start with the C Major scale since it contains no sharps or flats. The C scale is spelled as follows: C, D, E, F, G, A, B, C. Take a look at where the whole and half steps occur within the scale. All major scales follow a pattern of whole step, whole, half, whole, whole, whole, half. Note: For fingerings of five Major scale patterns, check out Matt’s Phase 2 Rock Series. Chapter 9: (9:52) Chord Theory Brad begins an ongoing discussion of chord theory in this lesson. Learning chord theory will help you immensely in a few specific areas. This knowledge is essential to learning what scales work over certain chords when playing a solo. Chord theory is also an essential tool in forming your own chord progressions. A chord is a combination of three or more notes that is played simultaneously. A contains three notes is called a triad. There are four types of triads: Major, Minor, Augmented, and Diminished. Formulas are used to determine which notes comprise each type of triad. Take another look at the C Major scale. A triad can be built from each note in the scale. These chords are referred to as “diatonic triads.” Let’s start with the first note of the scale, C. A triad consists of three components: the root, the third, and the fifth. The root is always the letter name of the chord-in this case, C. The third is the most important note in any chord. The third determines whether a chord is major or minor. 3 half steps make up the minor third interval. 4 half steps make a major third. To find the third, count up two notes in the scale from C. Thus, the third is E. To find the fifth, count up two more notes. The fifth is G.
Now let’s move onto the next chord. Begin with the note D. Count up two notes in the C Major scale. The third is F. Count up two more to A. This note is the fifth. These notes form a D minor chord. Chapter 10: (2:04) Final Thoughts In the following lesson, Brad will delve into some of the left-hand techniques essential to rock guitar playing. He will demonstrate how these concepts can be applied to the scales learn in this lesson. Oh dear, this painful. Its supposed to be Phase 2 - very elementary. when I practice this scale should I include the fourth finger on the G string? The scale that Brad showsand the scale at the end of the segment are different. Awesome. The best explanation that I have seen yet on how all of this material works. This moved the ball forward quite a bit for me. Thanks! I'm sure some else has mentioned it but the first blues scale is missing a note. The G sting has three notes on it. Is it just me, or is Brad not strumming all of the strings in the chord? I Know this isn't completely relevant to the lesson. I am having a bear of a time memorizing everything. I was wondering, how long did it take you to become a basic competent player? Great lessons Brad! Well explained. Everything just falls nicely into place! :0) Very happy! I take it back ... I have no idea what he's getting at that useful, but he is correct. lesson 5 looking at it for theory. D maj is D F# A you missed the E-F with no half step. hEY BRAD, when you make a scale should it go through all 6 strings or not?????? Brad, I see you are adding a note on this scale that I have not seen before, the fourth note on the scale, A string 6 th fret. You even look like it was added in at the last second, because you over look it when you first go over the scale. What gives? Another Question: the model shows, the penatatonic Scale in A m, starting at the low E string on the 5th fret. Why is this Minor? The third note, A string 5th fret is a D natural, am I correct? And would this not be a Major chord? Sorry about my confusion, love the lessons. The extra note that you see on the 5th string 6th fret, Is what makes it a blues scale .The extra note Is Called a (Flat 5) If I didnâ€™t add the flat five to the scale It would be called The Pentatonic 5 note scale . Now you can see how much the two scales are alike. Why is the pentatonic scale that Iâ€™m showing called a minor scale? Good Question! The Pentatonic scale Has 5 notes. The 1st, minor 3rd, 4th, 5th. Flat 7... If you notice there is no 2nd .That means the C note on the 8th fret the 6th string is the 3rd of this scale. The distance between the 1st note (A) and the 3rd note (C) is one whole step and one half step making this scale a minor scale. If I was to raise the 3rd note (C) one fret the scale would be a Major scale . Hi Brad. Why does the blues scale in this pattern not include the flat 5th in the second repitition, i.e 8th fret on the G string? Thanks Brad, that really helps alot in understanding. Your lessons are really good!! The flat 5 for the Am pentatonic would be the E flat I believe. Hi Brad, I am enjoying your teaching. But I can't find a way to download those tracks you talked about in lesson 5. I looked in supplemental content; no luck. I just tested scene 7 on all quality settings and it seems OK! Are you still having this issue? Perhaps you may want to try changing quality settings down and see if it helps, or clearing your cache in case there is a corrupted temporary file chilling on your computer. Hi Brad, Just a quick note. I think there is a typo in the supplement content with regards to the 8 bar blues. Shouldn't The second last bar read A7 D7 instead of A7 E7? Hi, I am doing Brad´s lessons now that I finished with the beginner lessons by Steve Eulberg for acoustic guitar. I am not using an electric guitar but sticking with my acoustic. Still works good. I find the C shape bar chord really taxing and practice it a lot. It is hard, but with lots of work and repetition it is getting better. I am 45 years old and have been playing for 1.5 years. Barre Chords are rough on my thumb but finally I am starting to notice a small breakthrough. I do lots of repetition of the material and practice a lot. This all just for your information. Being 59 yrs. old. I havent really played guitar since the sixties. I just have began again for a different hobby. Looks like he hsan't been around the web site for a while. I really enjoy his lessons for the blues. Where did the backing track go that Brad mentioned? I'm sure it must have gone to the backing track repository, but wouldn't it still be good to link to it here? Question though. Each progression seems to have the same rock-a-billy feel to it. Is that just common with the 12 and 8 bar blues. Or did you just pick that particular rhythm style. Great lesson Brad. really had allot of fun with it. Especially doing the shuffle. I found myself wanting to improv a little bit while playing by going back to the blues scale and adding some bends then right back to the shuffle. Brad, hey I really enjoy your videos. I must say that I have learned more from you in past few weeks than a lifetime of trying to figure things out myself. You have re sparked my interest in playing again. My goal is to be able to play clean, dynamic lead. I have a hard time switching from playing rhythm to licks. Do you have any tips for this? It would also be cool to see tab for your lead licks. I am trying to figure out but cant hit the same notes. Thank you in advance. Super lesson on explaining chord construction. in the major scale, the major chord of a particular scale consists of the 1,3, and 5 notes of that scale. what notes would the root chord consist of in the pentatonic scale? If you are playing the Minor pentatonic The Root chord would be spelled .1. Flat 3rd and 5. If you are playing the Major Pentatonic the root Chord is spelled 1, 3, and 5.
the video uses bar chords, but the tabs in the supplemental section show open chords? am i missing something? Brad teaches several ways of playing the 12 bar blues progression. At the beginning of Scene 4, he demonstrates the progression with open chords. In the middle of this scene, he plays the same progression with barre chords. It looks like I accidentally left this exercise out of supplemental content. I will be adding it shortly. Thanks for pointing this out. i guess your showing the tab using the barre chords under "blues shuffle" but just not showing the complete tabs. Lesson 5 I see a pattern being used to develop chords out of scales, it is 2,2,1,2,2,2,1 - is this the Ionian Mode? yes that is the Ionian . It looks like lesson 5 answered some of the lesson 4 questions. It's not different. The relative minor for a key is just a specific minor chord that sounds good with that key / chord progression. It is just a regular minor chord that sounds great when used in the context of the key. Hey Brad, can you ask the powers that be to put scales and progressions in the music tools link. thanks great lessons! I think that is something that has allready been talked about but i will find out for sure .Thanks for your input . Hi Brad, great job with the lessons! I just wanted to suggest that you take it down a notch with the distortion/gain on your guitar while demonstrating chords and even scales as it kinda makes the sound a bit blurred and harder to identify. Yes you are right. I do some palm muting .Its really just a feel thing for me .The hole thing with the strumming hand for me is a feel thing .Itâ€™s some times hard for me to explain what I do . I would find some blues songs Listen to the strumming pattern and try to copy what you hear and feel .Its the best way to come up with your own style. Hey Spider. The "name" of the box pattern really doesn't mean anything, it really just depends on where they start. A lot of people start teaching blues and pentatonic scales on the 5th fret, and refer to the one on the 5th fret as the "first" position. Others start higher up on the neck. I wouldn't focus so much on the name of the box pattern as memorizing the patterns and where they occur. It's generally the same scale just in different positions on the neck / different octaves. You get the same notes just on different positions of the neck. I don't see where you are geting the Pattern Box4 from . Does it say Pattern Box4 some were in the lesson ? I call the box pattern on the 5th fret were the root note is on the 6th string 5th fret the first pattern because that is were i decided to start . The pattern on the fith fret is the first pattern that I learned and the most common pattern to play . That is why I started there . I think this is the best one yet. GREAT. You can find backing tracks in the Tools -> Backing Tracks section of the site. Thanks for the Question, You are right on the video there is one note missing for the blues scale .The note is the flat five note .When you add a Flat five to the Pentatonic Scale it changes it to the blues scale .The flat five gives the pentatonic a more bluesy sound .I must have been thinking of the pentatonic scale when I made the chart for the video. I did add the flat five on the fifth string just forgot the 3rd string. the supplemental is right . I don't see the backing tracks in the supplement section. Where exactly are they? Thanks in advance. No quicktime, but I will redo them in MP3. I think for some reason I made this backing track a WMA, which was a pretty stupid move on my part. I'll put it on my fix list. Would it be possible to have jam tracks in quicktime format as this will work on my mac. Is the relative minor always the sixth note of the scale ? Yeah - the backing track is what I'm looking for. Thanks for your help. So where are the downloads to practice lead with? Brad talked about a posting of a 12 bar blues (chords) so I could work on filling in the lead? Where is it? I've been looking for something like this all over the net? Thanx.